Joseph "Joe" Dolce, born 1947 in Painesville, Ohio, is an American-born, Australian singer/songwriter who achieved fame with his multi-million-selling song, "Shaddap You Face", released under the name of his one-man show, Joe Dolce Music Theatre, in 1980. The single reached number one in 15 countries, it has sold more than 350,000 copies in Australia, remaining the most successful Australian produced single in music history for thirty-one years and selling an estimated six million worldwide. It reached No. 1 on the Australian Kent Music Report Singles Chart for eight weeks from November 1980. The track kept Ultravox's "Vienna" off the number one singles spot in the United Kingdom. Dolce was born in 1947 in Painesville, Ohio and formed various bands including Headstone Circus. with Jonathan Edwards (musician) who subsequently went on as a solo artists to have a charting hit song in the US 'Sunshine'. Dolce relocated to Melbourne, Australia in 1978 and his first single there was "Boat People"-a protest song on the poor treatment of Vietnamese refugees-which he donated to the fledgling Vietnamese community starting to form in Melbourne. 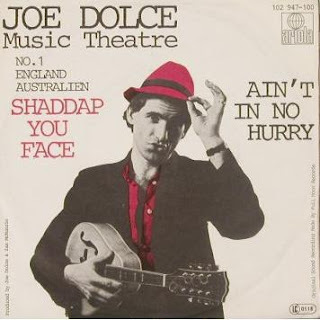 His one-man show, Joe Dolce Music Theatre, performed in cabarets and pubs with various line-ups including Lin Van Hek as singer/performance artist. In July 1980 he recorded the self-penned "Shaddap You Face", for Full Moon Records label at Mike Brady's new studios in West Melbourne. When in Ohio, Dolce would sometimes visit his Italian grandparents-they supplied the inspiration with "What's the matter, you?" and "Eh, shaddap". He wrote the song about Italians living in Australia and first performed it at Marijuana House, Brunswick Street, Fitzroy in 1979. Dolce paid A$500 for the recording and spent $1000 on the music video clip, which was created by Melbourne filmmaker, Chris Lofven. It became a multi-million-selling hit, peaking at No. 1 on the Australian Kent Music Report Singles Chart for eight weeks from November 1980, in UK from February 1981 for three weeks, also No. 1 in Austria, New Zealand and Switzerland. Dolce received the Advance Australia Award in 1981. Follow up single, "If You Want to Be Happy" charted in Austria (No. 7) and New Zealand (top 40) but not in Australia. Dolce's subsequent singles included "Pizza Pizza", "Christmas in Australia" and "You Toucha My Car I Breaka You Face" and he released two albums during this period, 'Shaddap You Face' and 'The Christmas Album'. With Lin Van Hek, he formed various performance groups including Skin the Wig, La Somnambule (1984) and the ongoing Difficult Women (1993). Van Hek and Dolce co-wrote "Intimacy", for the 1984 film, The Terminator's soundtrack. He has continued to perform solo shows and with his longtime partner, Van Hek, as part of their music-literary cabaret Difficult Women. Over the last two years Dolce has begun achieving recognition as a serious poet, winning the 25th Launceston Poetry Cup in Tasmania and having sixteen poems and lyrics selected by Les Murray for Quadrant Magazine as well as being published in Meanjin, Island, Cordite, and Divan. His first book of poetry Hatbox was released in 2010.